iPhoto's traditional single-palette view is divided up into three subsections. The Source list, found along the left side, links to your library, recent photos, subscriptions, devices, albums, Web sharing, and projects (see "Unified Design"). To the right, the main panel view will by default display your events, as well as any content you're currently viewing or working on. Below that, the bottom toolbar allows you to switch into full-screen mode, search, zoom, create a slideshow, check information, edit a photo, create a project, add pictures, and share your images. Unified Design: The iPhoto window has been divided up into three subsections: the Source list, the main panel, and the bottom toolbar. In full-screen mode, you lose some of the advanced nuances of the application, but gain a cleaner, simpler interface. The Source list disappears, giving the main panel full reign over the top half of the screen, while the bottom toolbar has been given a few new options—in addition to the Search, Zoom, Info, Edit, Create, Add To, and Share functions found in regular view, you can now select Events, Faces, Places, Albums, or Projects (see "New Tools"). You can toggle full-screen mode by clicking the Full Screen button or by pressing Option-Command-F.
New Tools: In full-screen mode, some of the items from the Source list move to the bottom toolbar. The source list In windowed mode, the Source list sorts your images into easily navigable sections: Library, Recent, Subscriptions, Devices, Albums, Web, and Projects. Within Library, your photos are divided up into Events, Photos, Faces, and Places. Events holds every collection of photos you've made or imported, while Photos displays a thumbnail view of every individual image in your library; Faces and Places collect images that have been run through iPhoto's facial recognition software and geotagged, respectively. Under Recent, you'll find quick links to your last-opened event, last import, last 12 months of pictures, flagged photos, and the contents of your Trash. Subscriptions, meanwhile, keeps a list of all the photo feeds you're subscribed to and allows you to view and refresh them within iPhoto. The Devices category only displays when you have a camera, phone, or card connected; the header disappears when not in use. Albums displays a list of your smart and regular albums, while Web shows a list of your connected social sharing services; Projects holds all of your card, calendar, slideshow, and book projects for easy access. All about the bottom toolbar If the Source list is about organization, the bottom toolbar is primarily focused on editing, altering, and making new creations. The Full Screen button will send you into full-screen mode, while Search and Zoom will search and zoom in on your photos, respectively. The Slideshow button in the middle will create a quick show set to music based on whatever group of images you've selected. Info will launch a secondary pane to the right of the main panel to display information about whatever you have selected. If you click an event with the Info pane open, you can change its name, add a description, tag faces, invent keywords, or geotag it. In addition to all this information, if you click a photo, it will also show a basic rundown of the image's classifications—what camera it was taken with, resolution, file type, ISO, lens, f-stop, and aperture. 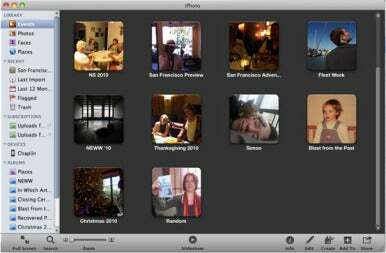 Click Edit while selecting a picture, and you'll be sent to iPhoto's image editor; click Create, and you'll have the option of using your selected picture or event to make a new album, book, card, calendar, or slideshow. Add To lets you add pictures to an album, book, card, calendar, or slideshow you've already created. If you have a photo (or set of photos) you'd like to share with the world, the Share button allows you to order prints or add it to a MobileMe gallery, Flickr, Facebook, or e-mail. 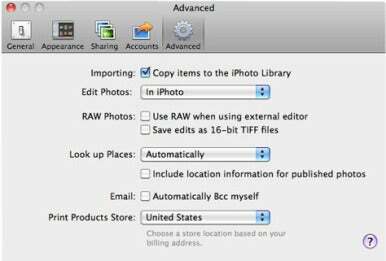 Tweak your settings Unlike some of the more advanced applications, iPhoto doesn't have many special preferences you can adjust. However, for some simple tweaks, mouse on over to iPhoto -> Preferences. There, you can adjust General, Appearance, Sharing, Accounts, and Advanced settings (see "Special Adjustments"). Special Adjustments: If you plan on pushing iPhoto to the limit by editing pictures in an external editor, altering settings for converting raw images, customizing geodata, and selecting a country for the Print Products Store, you'll want to check out the Advanced section of iPhoto's Preferences menu. When you first import your pictures into iPhoto, they're all gathered into an event (or, if you had it set to autosplit days, multiple events) and named by date. While you can still decently manage your library if you just use this default naming and organization system, you can use events in all sorts of crafty ways to really take control of your photos. Events versus albums When Apple first introduced Events in iPhoto '08, many users were unsure exactly how this organization scheme was any better—or any different—than creating an album. While initially confusing, the easiest way to describe the division is this: Events is a container for all the images and video from a certain time or occurrence, while Albums contains curated collections (see "In a Shoebox"). In a Shoebox: Like a labeled shoebox full of 4 by 6 photographs, Events is designed to hold the entirety of one trip or day, while Albums highlights specific pictures. For instance, say you went to Disney World for a weekend. After the trip, when you import your photos, you dump the entire weekend into one event labeled "Disney Trip 2011." However, to show the pictures off to your friends on Flickr, you want to highlight each park; to do so, you create four albums and drop the best of each park's photos into them. Create a new event While it's nice to pretend that we're all organized photographers who shoot only one day's activities on a card before importing them, it's far more likely your camera is filled with multiple events. iPhoto offers some initial organizational help by allowing you to autosplit events by day when importing, but even that can't help you if you've been shooting in multiple locations over a 24-hour period. Luckily, it's easy to create a new event—all you need to do is select a single photo you wish to base it on. Once you've done that, choose Events -> Create Event, and the image will be withdrawn from its current event to create a new one. You can do this with multiple photos as well: Highlight the pictures you want, then go to Events -> Split Event. Want to create a new event using images from multiple other events? Flag the photos you'd like to use by clicking on the transparent flag in the upper left corner of the images, or by using the keyboard shortcut 1-period (.). Once you've marked the images you want, go to Events -> Create Event From Flagged Photos. Manage existing events Once you've created an event, there are many things you can do to keep it nicely organized. Filling in information, geolocation data, and keywords can be a good start; you can also add, delete, or change the photos contained within. Sometimes the images from one trip are split into multiple events, which you want to combine. To merge events, click and drag one on top of the other. Whichever one you drag will be incorporated into the other event; make sure that if you're adding new photos to an event, you always drag the new images on top of the old. Extra Juicy Info: You can change your event's title, key photo, description, and more using the Info panel. To delete an event in full, select it and press Command-Delete. This will also send any pictures in that event to the Trash, so make sure you've rescued any stray images you still want before you delete. If you want to add more information to an event, select it and click the Info button on the bottom toolbar (see "Extra Juice Info"). A side panel will slide in, displaying the key photo (which represents the event), its title, the range of dates at which the photos were taken, how many photos are in the event, faces (if any), any keywords, and the event's location (if one exists). You can change the key photo by mousing over the key photo preview until you find the picture you want, then clicking it, while most of the text fields can be edited with a single click. The Faces dialog is unfortunately just a statistic—to identify or change facial recognition, you'll have to go into the event itself. To add a keyword, type the phrase you wish to tag and press Enter. Note that any keywords you assign to the event will also be added to every picture within it. The same applies for geolocation data—if no location has been assigned, you can double-click the Assign A Place box to type in the event's whereabouts. Many of the steps regarding event creation can also be applied to album creation. To create a new album, select the pictures you wish to use and click the Create button in the bottom toolbar. Select Album from the pop-up, and those images will be copied into an album for your viewing pleasure. You can also select whole events, or even multiple events. Once you create an album, it appears under the Albums section of the Source list. To add photos, you can either highlight them and click the Add To button in the bottom toolbar or drag the photos you've selected directly to the album in the Source list (see "Drag 'n' Drop"). Drag 'n' Drop: To add images to an album, just drag them from the Events or Photos library to the album in question. You can even do this with whole events, if you like. If you're planning on publishing picture collections to the Web using Flickr, Facebook, or MobileMe, albums are a great way to easily collect those pictures. Once you have your album the way you like it, select it in the Source list and click the Share button in the bottom toolbar to send those photos to the social network of your choice. Highlight multiple photos in iPhotoIt's easy enough to select a few photos in a row by drawing a highlight box around them, but if you want to select many concurrent pictures, or ones scattered throughout an event, you will need to know some basic key shortcuts. To highlight many pictures in a row, click the first picture, scroll down to the last one in the series, and Shift-click it. This will select every image in between the first and last photo you indicated. To highlight pictures that are in a random order, click the first picture, then, for every subsequent picture, 1-click. Be careful not to go back to a regular click before you're finished, or you'll lose every picture you've selected. You can also use this to deselect pictures already highlighted. If you've added text information to your photos, it's a snap to find them using iPhoto's Search function on the bottom toolbar. But what if you're trying to find all the photos you've taken with your sister at Disneyland, or those hidden pictures of your ex? For more difficult problems, keywords and smart albums can be much better suited to the task. What are keywords? 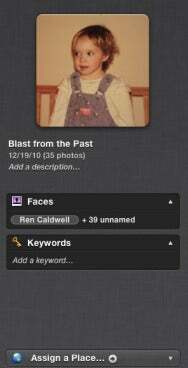 Before Faces and Places were introduced as part of iPhoto '09, keywords were the simplest way to tag photos of people and places to make them easily accessible and searchable later on. You could create them in the keywords manager, then add them to a photo (or group of photos) by selecting the images and clicking on the keyword. You could even assign frequently used keywords a keyboard shortcut for easy tagging. Use keywords effectively With Faces and Places available to take care of people and location organization, keywords play a less central role, but you can still put them to good use—if you know how. iPhoto's Search will check for any text-based information you've input into a photo, but it can't see most of an image's photographic metadata like photo type (JPEG, PNG, raw, and so on), ISO, lens depth, or f-stop. To sort your JPEG images from your raw images, you could use a keyword to classify those pictures as such. Additionally, if you're trying to tag pictures that have a group of people, rather than a single face—say, your college a cappella group—keywords will be a much bigger help than the Faces feature. It's also good to note that if you're planning on adding photos to Flickr using iPhoto's built-in uploader, your keywords will automatically convert to tags, saving you the hassle of retagging everything. Add and edit keywords The easiest way to add a new keyword to your image (or group of images) is by selecting them, then clicking the Info button on the bottom toolbar, to bring up the Info pane. Under the Keywords section, begin typing. iPhoto will try to suggest previously used keywords for you as you're typing; you can either let it autocomplete by highlighting the suggestion and pressing Return, or finish your original keyword by continuing to type and then pressing the Return button when finished (see "Autokeyed"). 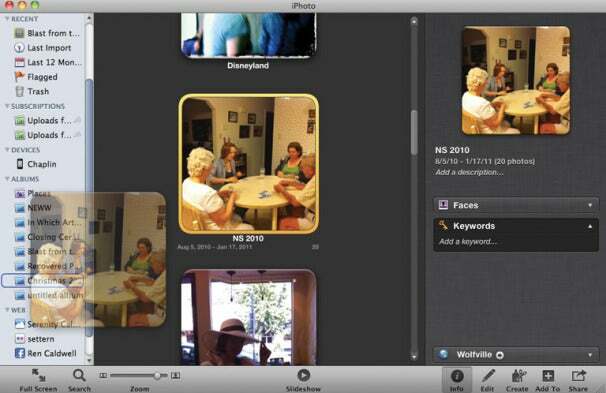 Autokeyed: iPhoto will try to suggest keywords you've used in the past to speed up the tagging process.